FC Exchange is a leading currency provider offering bespoke international money transfers for each client’s individual needs. They offer a Best Exchange Rate Guarantee to give their customers exchange rates up to 4% more competitive than other providers. Also, they are FCA approved to transfer your funds safely and quickly – wherever you are in the world. FC Exchange’s specialist knowledge of the currency market and plethora of emigration experience has enabled thousands of clients to relocate to the USA and save thousands in the process. How can currency specialists like FC Exchange save clients money? Clients can benefit from competitive exchange rates up to 4% better than banks and other currency providers. FC Exchange offers a Best Exchange Rate Guarantee for peace of mind. FC exchange puts its clients first and establishes each customer with an experienced account manager to help them navigate the currency transfer process with tailored services that can maximize their funds. The amount quoted is exactly what a client pays; no hidden fees or tagged on commission to weigh down currency transfers. Clients can save up to $50 per international money transfer in fees alone. Rather than offering generic services, FC Exchange takes time to get to know every client’s needs. FC Exchange can create a bespoke currency trade tailored for an individual’s exact requirements, and ensure clients get the most dollars for their money. They can even secure customers a favorable rate today that can be used at any point in the next two years to save them thousands in massive market shifts. Clients don’t need to spend hours monitoring the currency market with FC Exchange’s regular reports highlighting the most significant events. If a chosen currency pair begins to make noticeable movement, FC Exchange can get in touch with their client immediately. Thus, making sure a favorable exchange rate doesn’t slip past their notice. I don’t know anything about the market – how do exchange rates work? When you’re transferring one currency for another, the two currencies you’re dealing with form a currency pair. For instance, your pound to US dollar (GBP/USD) currency pair may be trading at 1.60, which simply means, for every £1 you trade, you’ll receive $1.60. 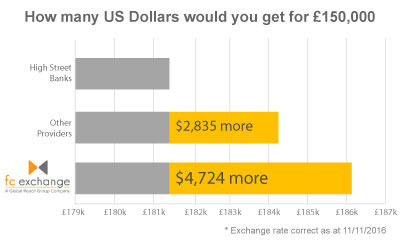 On larger sums the exchange rate can be more noticeable; if you were buying a house in the USA and had £300,000 to spend, with a GBP/USD exchange rate of 1.60 you’d expect to have around $480,000 in your budget. How can I save the most money moving a large lump sum overseas? If you’re looking to buy a property abroad or want to move your life savings overseas, you can save money in a variety of ways by using a broker. A broker will help to determine your specific requirements and create a trading strategy with you as well as ensuring you get a bank-beating exchange rate that can offer you up to 4% more for your money. Additionally, you won’t have to worry about fees or commission and if you like an exchange rate now, you can lock it in to use at any point in the next 24 months, so you’ll never need to worry about big market shifts. Can I save money on my currency transfers if I’m making regular overseas payments? If you’re moving money abroad on a regular basis it can be important to seek specialist guidance to obtain the most competitive exchange rates and ensure your money transfers easily into your account with fee-free. FC Exchange understands that regular payments, whether they be for a business or a pension transfer overseas, can soon add up so it’s important to maximise your trade, every time you transfer funds for a better overall result. How can currency brokers offer more competitive exchange rates than my bank? A bank makes profit on currency transfers in two ways; firstly, by charging fees and commission; and secondly by offering less competitive exchange rates. When researching exchange rates, you might have come across the term interbank rate. The interbank (IB) rate is the level at which a major currency provider can buy currency for. When the broker or bank sells the currency on to you, the difference between what they paid for the currency, and what they sell it to you for, is known as the spread. Banks have bigger spreads than brokers, which means you’ll typically get 3-4% less for your currency transfer and earn them more profit on the transaction. Meanwhile, brokers still earn money for their currency transfer service, just with a significantly smaller spread. Pair a bank’s less competitive exchange rate with their average fees of between $12-50 as well as commission, and you’ll find your currency transfer can be much more expensive than you first thought. It may not seem significant in smaller terms, but when you’re transferring thousands of pounds for a property purchase, you can gain tens of thousands, just by steering away from your local bank and using a broker. Exchange rates seem to move a lot; how can I safeguard my money against a market shift? The currency market is one of the most volatile trading platforms in the world. Exchange rates can fall by huge percentages in a small space of time, meaning that if something happens to cause a market shift, you could be losing money every second. So how do you know when the best time to trade is? If you keep an eye on economic data, political developments and commodity prices you may be able to forecast when your most opportune times to trade are. However, if you sign up to a reputable broker like FC Exchange, you'll be given your own personal account manager who can offer you guidance and help you trade when the exchange rate is trending in your favor. What's more, they can help you to protect your funds from the worst market movements that can sometimes be caused by unexpected events, such as terrorism, natural disasters, or political unrest. Whether you want to fix an exchange rate now ready for you to use in the future, or set limits for your currency pair and trade when it reaches those levels, there are plenty of ways a broker can help you to make your foreign exchange transfer as profitable as possible - no matter what the market's doing.